When you think about it, a guitar amplifier is first and foremost an instrument. It is the sound of the electric guitar. Take away the amp and you no longer have an electric guitar. It is what separates electric guitar sounds from acoustic guitar sounds. And since it is an instrument, it is not designed like other amplifiers. With all other amplifiers, the output is exactly like the input, only louder. But with a guitar amplifier, the output is still louder than the input, but the output must sound �Better� than the input. It must have character! It must be exploitable by the player�s picking nuance to get tones that one would not find with the so called �perfect� amplifier we studied about in college. 6. The Compression of the note, also called "sag" or "blossoming"
The Revolutionary KENDRICK DOUBLE TROUBLE COMBO. Of course one can still control volume either with the guitar�s volume control (preferred for getting maximum clean with longer sustain) or cutting back on the �Body� and �Shine� controls. 1. Onboard bias meter and bias trim pot directly on the faceplate. This allows you to bias your amp anytime you wish in the time it takes for the tubes to warm up. This feature comes in handy when replacing tubes or just setting your amp (which is a musical instrument) to its best sound before a gig. The bias meter has a dial that goes from zero to a hundred. The factory bias setting is 50. If you want the amp to break up sooner, the bias can be adjusted above 50. If you want your amp to stay cleaner longer before breakup, you can set it less than 50. Once you find the perfect place that you like, you can duplicate that setting at any time in the amount of time it takes for the tubes to warm up. You tune your guitar every time you play. Doesn�t it make sense to tune your amp, especially if you are playing clubs or outdoor venues where the AC stage voltage may be too high or too low? 3. Two 6V6 output tubes configured in Class AB Push-Pull. Everything you have ever heard by Hendrix, Beck, Gibbons, Ford, Bonamassa, Johnson, etc. is Class AB Push-Pull. It is the sound of smooth tube overdrive (violin- cello tones) and crystal clear clean tones. 6V6's let you hang with the drummer but keep stage volume reasonable. 4. Massively overbuilt custom-made KENDRICK transformers. Your girlfriend was right - Bigger is better! The Double Trouble custom wound transformers are wound with thicker wire which improves the �sting� and minimizes losses. The Five-winding interleaved paper-bobbin output transformer has as much iron in it as a Twin. Such fast response, there may be times that you think the amplifier played the note before you did! I promise it will make you a better player� in the same spirit that getting off your MoPed and riding a Harley will make you pay attention to what you are doing! 5. Multiple preamps � Just as multiple amps always sound better than one, the multiple preamps deliver complex signals to the output stage for a thicker and richer overall tone. 6. Antique Lightweight Northern White Pine custom cabinet. Old growth wood has tighter growth rings and has noticeably better resonance. 8. Analog Spring Reverb � Special circuitry with so much headroom that it is impossible to distort the reverb. 9. Optional Padded and Lined custom American-made soft cover with a Velcro bottom-flap available for an upcharge. 10. Entirely hand-built by professionals � Our "Dream Team" crew has been hand-building amps for a very long time. Our main wiring/soldering guy just celebrated his 28th anniversary wiring KENDRICK amplifiers 5 days a week. My cabinet guy started with us, covering and building cabinets, over 25 years ago. And I personally trained my head technician starting in 1998 � twenty years ago. No one builds better quality built amplifiers than KENDRICK. We know what we are doing. I am pricing these fine amps to sell at $2,995 (which is probably too low). I will be taking preorders with a deposit and the balance due when it is ready to ship. Because this is a big project, figure two to three months before the amps start actually shipping. To stimulate early sales commitments and get the proverbial �ball a rollin��, I am offering the first ten of these fine units ( make that six, because we already have four commitments) on a preorder basis for only $2,495 plus ship! Put $1,250 sincerity deposit down and pay the balance when it is ready to ship in 2 to 3 months. It is a win win. You save $500 and have plenty of time to �weed and feed�, (if you need to appease the Commander in Chief); and I get commitments on the first 10 units. 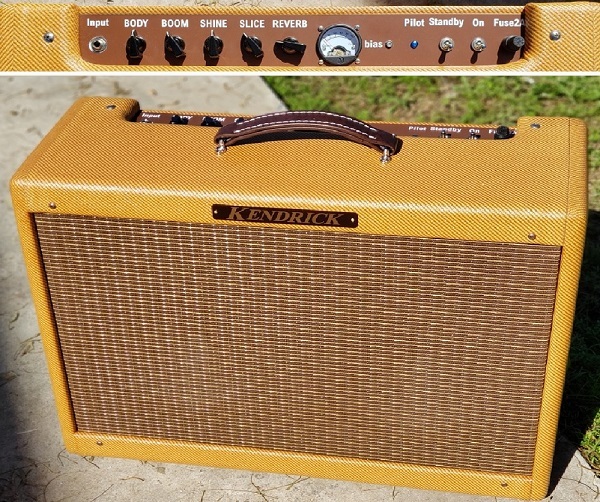 Bear in mind each amp is custom-made by me and my �Dream Team� crew, so we can customize it or cover it in whatever custom covering or grill cloth you like, usually at no additional charge. The INTRODUCTORY OFFER IS LIMITED AND ONLY AVAILABLE BY PHONE OR EMAIL. Call me or email and let�s get you under the wire on this incredible introductory offer as you won't get it by ordering on our website.